Extracorporeal shock wave lithotripsy (ESWL*) has revolutionized the management of upper urinary tract stones. Its success and safety have led to a proliferation of machines and of urologists trained in their use. Therefore, it is not surprising that at some institutions urologists have been asked to apply their expertise to fragment biliary duct calculi. At Dalhousie University 32 patients (13 males, 19 females) with a mean age of 63 (range, 25 to 92 years) have been treated with an unmodified Dornier HM3 lithotripter. These patients had gallstones in the cystic duct (3 patients), hepatic duct (5 patients), or common bile duct (28 patients). All patients had been operated upon previously by a general surgeon and subsequently were evaluated by an interventional radiologist. Time from open surgery to extracorporeal shock wave cholelithotripsy ranged from eight days to 22 years. All stones were considered inappropriate for percutaneous or endoscopic manipulation because of size or location (13 patients), previous unsuccessful attempts at such procedure (11 patients), or were retained postoperatively (8 patients). Stones varied from 2 mm to 21 mm (mean 13 mm); one was calcified, and the others were radiolucent. Nine patients had more than one stone. Imaging was possible by introducing contrast media through cholecystostomy tubes (1 patient), transhepatic tubes (7 patients), nasobiliary tubes (10 patients) or T-tubes (14 patients). Ten patients required repeat therapy. The average number of shock waves required per session was 3,012 (range, 525 to 8,000) at 18 kV to 25 kV. Twenty-four patients either passed the fragments within one month (30 patients) or had them fragmented small enough to be removed by percutaneous or endoscopic techniques (10 patients). One patient required further open surgery. Morbidity was limited to transient elevation of LDH, transaminase, alkaline phosphatase, and the development of asymptomatic hemobilia and hematuria. One patient developed pancreatitis. 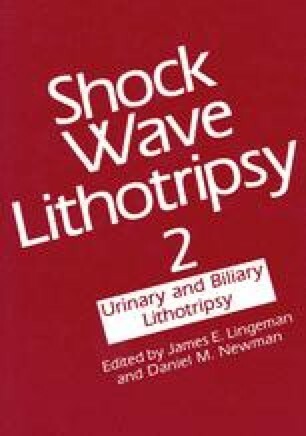 Because the number of situations in which shock wave lithotripsy can be used is limited, it may be difficult for physicians other than urologists to acquire and maintain the necessary skills to operate a lithotripter. Until specific biliary lithotripters become widely available, urologists may continue to be asked to assist in the management of patients with gallbladder stones.